An eleven-year-old's joys of rural life in a Black community setting on a large sugar plantation in Louisiana in the 1940s, but upon witnessing the heartaches of racism, segregation and suppression, he realizes, while the world around him was changing, he must make choices based on the dictates of the economic and social order that existed in the place and time in which he lived." On June 19th, 1946, Billy, the 11-year-old son of the overseer of a large sugar plantation, was the first person to arrive at the crash, near his home, of a World War II fighter plane, owned and piloted by a 23-year-old friend of his family. The emotional results of the tragedy weighed heavily on the mind of the young boy, whose life had been lived mostly in the close black community setting of the plantation in Central Louisiana. The stories and events surrounding his life, from June 19 until the day after Christmas in 1946, bring to the reader the purity of the times as they were lived and understood by Billy. Through his eyes, mind, heart, and voice the reader moves with him as events and circumstances jolt him from the freedom of a unique childhood into what Billy perceives as a precarious youth and time. Billy’s adventures - some sad, some funny - with his friends on the plantation, especially his close friend Papa, give insight into a time and place and a microcosm of a world lived over half a century ago – a rural world etched by real people whose lives were woven together by the emotional and physical strength of each day’s purpose. The reality of a national economic base, realized from structured employment, had not yet cast its net on the agrarian society of the little towns and along the country roads of the South. But most of all, the divisiveness and vocal clamor of racism and segregation had not yet severed the hearts of those who lived and worked on the sugar plantation Billy called home. The stories and their substance, together with the dialogue, bring the reader into each event as a spectator who may form his own opinions based on what he hears and sees. Through the events he witnessed, and muddled by the changes in the social structure as he knew it in his small world, Billy eventually succumbed to the realization that he had no choice but to conform to those structures as they were; realizing with heartfelt reluctance that he could no longer step back and forth as he had done as a child, crossing the long-established lines of segregation. Billy’s childhood view of racism and segregation might arise today, making his youthful choices in December of 1946, a view which some readers might possibly allow themselves to consider, but, most likely, would deny completely as having ever existed, especially in today’s world of political correctness. The memories in my heart and mind I dedicate to my parents and to my sisters and brother - my blood family. 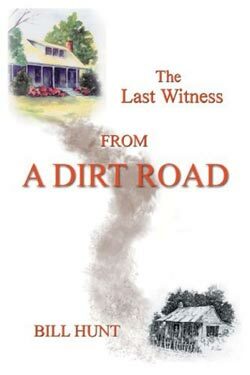 The stories in this book are dedicated to the many families whose lives intertwined with ours when our families lived together on THE DIRT ROAD. This book, in whole - everything from front to back cover, is dedicated to every soul whose chances, choices and hopes, were taken away from their life by a dirt road of some kind, somehow, somewhere. Bill's book will be in major stores in the very near future. Buy one for yourself and send one to a friend.